author, editor, teacher, survivor of life, baker of bread, churner of butter, and she's funny too. she done wrote a book that she's sure you'll enjoy. and she's gonna write more. just watch and see. My whole body hurt. The pain thundered in my head. so much pain, I had to give it an 8.
how perplexing it is, still. The Pain Scale. 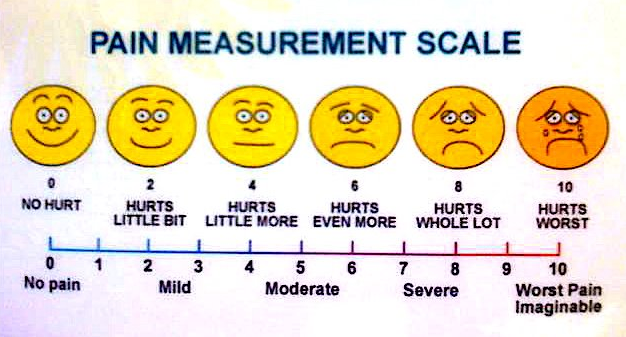 none of that made me understand The Pain Scale until Day 2.
who made possible their disaster-ready modernization. that hadn’t been touched since the 70s. in a country that always claims to never forget. shackled by tubes and tanks. “On a scale of 1 to 10, what’s your pain?” Dr. Rachael asked. beauty (and how she walks) is in the eye of the beholder. Then she showed us a picture. Dad reached out his shaky finger to the sad face next to the teary one. “So about an 8,” she said, ordering meds accordingly. Dad nodded and smiled. “Nice try, Dad,” I said. Dr. Rachael said Dad could go home when his pain was a 6. Just 2 points less. Still, Dad was shooting for a 6. Or the less orangey-yellowy, less frowning face. when for all of us, it became a pain without faces, without numbers.